Upgrades to 6 facilities in 6 counties. Affects 200 miles of pipeline. and come to this if you are able. Please share this on your local listservs. Come to the hearing Wednesday in Madison County. (Hint: Turn off all layers except Operational Pipelines and Compressor Stations). There are many things to explore on this map. Zoom in and pan around. We need you in Madison County this Wednesday night, October 8th. Dominion Transmission Inc. (DTI) — the same folks that brought you Cove Point LNG — is now threatening to dramatically expand the use of fracked gas in New York State and pump hundreds of thousands of tons of greenhouse gas into the air. Dominion calls it their “New Market Project”. The project would increase by 112,000 Dekatherms per day the capacity of Dominion’s main pipeline, which brings gas north from the fracking fields of Pennsylvania to the Finger Lakes, Syracuse, and points east to Albany. But to push larger and faster volumes of gas through its aging pipeline, Dominion intends to build two big new compressor stations inChemung County (Horseheads) and Madison County (Georgetown), and massively expand a third one inMontgomery County, south of Fort Plain near the Otsego County line. Additional facilities would also be built or modified in Dryden, Utica, and Schenectady. More gas means more fracking, air and water contamination, risks to public health, and accelerated climate change. And the three proposed compressor stations would be huge, noisy 11,000 horsepower industrial facilities that threaten public safety and continuously pump carbon dioxide, methane, and hazardous chemicals into the atmosphere 24/7. Altogether, they would be responsible for over 200,000 tons of additional greenhouse gas emissions each year. To make matters worse, the Federal Energy Regulatory Commission (FERC) is not even requiring an Environmental Impact Statement (EIS) to consider impacts. Instead, the project is being reviewed through a much more abbreviated process called an Environmental Assessment (EA). Furthermore, despite the fact that Dominion’s New Market Project impacts much of New York State and spans 200 miles of pipeline, the public has been granted only ONE scoping hearing. * It is an outrage that FERC has scheduled only one scoping hearing for a major project that impacts much of New York and 200 miles of pipeline. Demand that additional scoping hearings be held and that the timeframe for submitting comments be extended. * FERC should require a full Environmental Impacts Statement (EIS) instead of letting Dominion pursue an expedited Environmental Assessment (EA). The EIS process would require a much more comprehensive analysis of direct, indirect, and cumulative induced impacts, critical to a project of this scale. Demand a full EIS. * Dominion has named this its “New Market Project” because it wants to create new markets for fracked gas. Therefore, in addition to studying impacts of the project’s components, a comprehensive build-out analysis of cumulative impactsresulting from the increased use of fracked gas should be performed, including the likelihood of future power plants, CNG/LNG facilities, and other types of gas-related infrastructure for distribution. A build-out analysis should also be performed of negative environmental, health, and societal impacts of more drilling and fracking enabled by additional flow capacity in the pipeline. Both upstream impacts (like harm to air, land, and water resources from gas wells) anddownstream impacts (like radon gas in homes) should be studied. * The Dominion pipeline connects to the Iroquois pipeline, which is planned for reversal so that it will carry gas from the U.S. to Canada. Dominion will therefore be a direct conduit for exporting fracked gas. FERC must analyze this conflict in determining domestic public need. It is also improper segmentation to consider this project without regard to all of the economic and environmental impacts of exporting natural gas, which the project facilitates. * A comprehensive health impact assessment should be performed to evaluate the potential negative effects, short and long-term, to people living near and at various distances from the proposed compressor station projects. 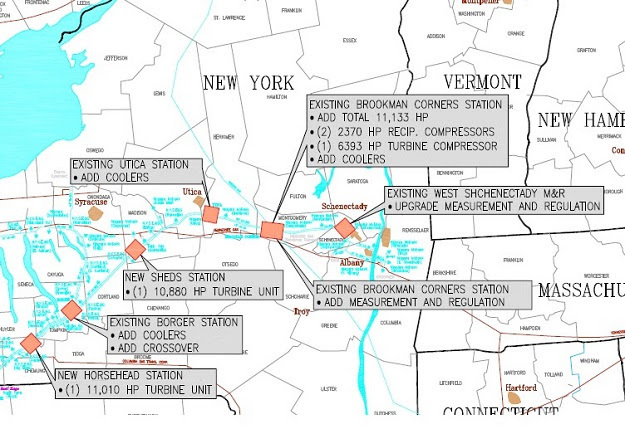 * Surrounded by homes and farms, the expanded Brookman Corner compressor (south of Fort Plain near Otsego County) would spew over 96,000 tons of greenhouse gas emissions into the air every year, nearly twice the emission rate of the other two proposed compressors (each projected to release 54,000 tons per year). This is unacceptable. * The public must be granted full access to information, including critical energy infrastructure information (CEII) necessary to assess emissions and safety factors. * The greater risk of pipeline failure due to increased pressure and flow rate must be fully analyzed, especially since parts of Dominion’s pipeline network are up to 50 years old, have corroded with age, or may have been constructed using outdated, inferior welding techniques. Maximum allowable operating pressure must be made public and verified. * Safety and compliance records of the operator must be disclosed in the record and considered by FERC.